These terms and conditions outline the rules and regulations for the use of our Website (www.cruisecrocodile.com) as it applies to all visitors and others who access or use this website. By accessing this website, you are agreeing to be bound by these website Terms and Conditions, all applicable laws and regulations, and agree that you are responsible for compliance with any applicable local laws. If you do not agree with any of these terms, you are prohibited from using or accessing this site. The information, guides, and resources (hereafter referred to as “Materials”) contained in this website are protected by applicable copyright and trademark law. This license shall automatically terminate if you violate any of these restrictions and may be terminated by Cruise Crocodile at any time. Upon terminating your viewing of these materials or upon the termination of this license, you must destroy any downloaded materials in your possession whether in electronic or printed format. If you choose, or you are provided with, a user identification code, password or any other piece of information as part of our security procedures, you must treat such information as confidential. You must not disclose it to any third party. We have the right to disable any user identification code or password, whether chosen by you or allocated by us, at any time, if in our reasonable opinion you have failed to comply with any of the provisions of these Terms and Conditions. If you know or suspect that anyone other than you knows your user identification code or password, you must promptly notify us in writing to info@cruisecrocodile.com. Cruise Crocodile takes no responsibility for any User content created, accessible or delivered on or through CruiseCrocodile.com. We do not monitor or exercise any editorial control over such content. The User is solely responsible for (i) any content stored, published or made available through our Website by its Users and (ii) compliance with all laws applicable to the publication and distribution of such content. User shall be solely responsible for maintaining a copy of its content. The materials appearing on CruiseCrocodile.com could include typographical, technical, or photographic errors. Cruise Crocodile does not warrant that any of the materials on its web site are accurate, complete, or current. Cruise Crocodile may make changes to the materials contained on its web site at any time without notice. Cruise Crocodile does not, however, make any commitment to update the materials. Where the Site contains links to other sites and resources provided by third parties, these links are provided for your information only. We have no control over the contents of those sites or resources. 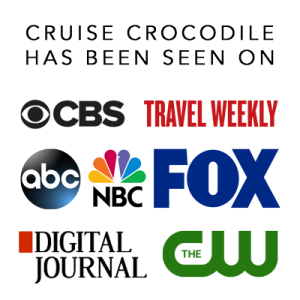 Cruise Crocodile has not reviewed all of the sites linked to its Internet web site and is not responsible for the contents of any such linked site. Furthermore, the inclusion of any link does not imply endorsement by Cruise Crocodile of the site. Use of any such linked website is at the user’s own risk. Communication, engagement, and actions taken through external social media platforms that this website and its owners participate on are custom to the terms and conditions as well as the privacy policies held with each social media platform respectively. CruiseCrocodile.com may use social sharing buttons which help share web content directly from web pages to the social media platform in question. Users are advised before using such social sharing buttons that they do so at their own discretion and note that the social media platform may track and save your request to share a web page respectively through your social media platform account. The materials on our website are provided “as is”. Cruise Crocodile makes no warranties, expressed or implied, and hereby disclaims and negates all other warranties, including without limitation, implied warranties or conditions of merchantability, fitness for a particular purpose, or non-infringement of intellectual property or other violation of rights. Further, we do not warrant or make any representations concerning the accuracy, likely results, or reliability of the use of the materials on its website or otherwise relating to such materials or on any sites linked to this site. In no event shall Cruise Crocodile or its owners be liable for any damages (including, without limitation, damages for loss of data or profit, or due to business interruption,) arising out of the use or inability to use the materials on Cruise Crocodile’s Website, even if Cruise Crocodile has been notified orally or in writing of the possibility of such damage. Because some jurisdictions do not allow limitations on implied warranties, or limitations of liability for consequential or incidental damages, these limitations may not apply to you. You agree to indemnify and keep indemnified Cruise Crocodile from and against all claims, damages, expenses, costs and liabilities arising in any manner from your entry to and use of our Website other than in accordance with these terms and conditions. You expressly understand and agree to submit to the personal and exclusive jurisdiction of the courts of the country, state, province or territory determined solely by Cruise Crocodile to resolve any legal matter arising from these Terms and Conditions. If the court of law having jurisdiction, rules that any provision of the agreement is invalid, then that provision will be removed from the Terms and the remaining Terms will continue to be valid. We reserve the right to amend this Terms from time-to-time, in its sole discretion, effective upon posting a revised copy of the Terms and Conditions on this page. Any use of the Website after such modification shall constitute acceptance of such modification. For enquiries about these Terms and Conditions, we may be contacted through email at info@cruisecrocodile.com.